William Jewell College needed practical, reliable, flexible technology to support collaborative learning. That’s Dr. Anne Dema, Provost of William Jewell College in Liberty, Missouri, describing the school’s new Pryor Learning Commons. After more than five years of planning, the school has opened its facility as a place where students can learn together and professors can try out the latest teaching methods, find out what really works and propagate it across campus. William Jewell is a logical place for this kind of experiment, since the college has always emphasized instruction. It’s a place where there are only 11 students for every faculty member, where the largest room on campus seats only 48, and the average undergraduate class size is just 16. It’s a place that embraces the flipped classroom teaching method that emphasizes discussion and dialog rather than lecture. Among the many innovations are collaborative workstations and classrooms that facilitate the sharing of ideas and information. Kansas City-based communication technologies and products integrator, Mission Electronics programmed and installed the technology in the Pryor Learning Commons. If you were to visit the new Pryor Learning Commons, most likely you’d enter from the first floor, where you’d be greeted by a welcome display and a touch screen kiosk with information about the campus. Once inside, you’d find a large, open common area with comfortable seating and three “collaboration tables,” each of which includes a 40” flat screen display, seating for four students, multiple wireless AirMedia connections, one wired input to the display, and a five-inch Crestron touch screen that controls input selection. “We emphasized access to information, interactivity, and collaboration in designing the technology for this building,” explains Joe Nickell, principal of AV plus Design, Inc. of Shawnee Mission, Kansas. Thus a large classroom on this level has two 80-inch touch-sensitive displays at the front, set up to work as interactive whiteboards, plus three continuous walls of glass marker boards, four 55-inch flat screens on the side walls, as well as a document camera, Blu-ray player, sound system and a 24-inch Crestron touch screen with annotation capability. Students work in groups of six at eight star-shaped tables, each with a hardwired computer input plus wireless Crestron AirMedia inputs, so that students can use their own laptops or mobile devices, sending images to the wall-mounted displays to others in the group or to the entire class. The tabletops also have whiteboard surfaces, so that students can draw on them with dry-erase pens. A second “Innovation Studio” includes four student collaborative work tables and an 80-inch touch-sensitive interactive display, plus five additional 40-inch displays, a document camera, Blu-ray player, 24-inch Crestron touch screen with annotation, and a sound system. One of the most interesting pieces of technology in the Innovation Studio is a Crestron Capture HD recording device tied to a video conferencing system and its PTZ cameras. The school uses this combined system in three ways. First, they can bring in guest speakers to address classes or other groups from distant sites without the need to travel to the campus. Second, they can record student presentations. Third, they can record the way students interact in class, so instructors can fine-tune their collaborative teaching methods. 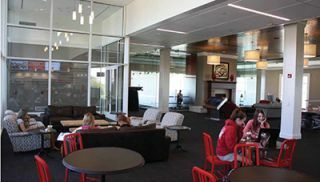 William Jewell’s ”Innovation Studio” includes four-seat student collaborative work tables with touch-sensitive interactive displays. Below, dynamic digital signage helps reinvent the typical campus canteen. In a way the whole building is a media studio. It’s open 24/7 to anyone with a student ID, and the classrooms are never locked. The technology is always available for student use. The middle floor includes a large open common area for meetings and study, three offices and two group study rooms, each of which includes a collaborative workstation. There’s also a faculty commons with AirMedia collaborative capabilities. The top floor or “quad level” features an entrance from the campus quadrangle, also with an interactive greeting kiosk, a cafe for students, an open common area plus three group study rooms, each with a collaborative workstation. The two classrooms and a building-wide CATV system are united by a Crestron DigitalMedia network, with two DM32X32 matrix switchers allowing users to switch any source device to any combination of displays. To help students best take advantage of these resources, the classrooms, studios and collaborative study rooms are tied into an Outlook calendar using Crestron Fusion RV and Crestron scheduling panels mounted outside each door. Students and staff can reserve these rooms via the panels or their computers and other devices; they can tell at a glance which spaces are available at any given time. Dema says AV plus Design and the technology committee had several criteria in mind when designing the collaborative systems. “We knew we wanted an environment where our students could talk to each other easily and see what everyone was doing. It had to be wireless, because that’s the way our students work. We also know that most of them have multiple devices, including laptops, tablets and smart phones, and they want to be able to use whatever they happen to have in hand at a given moment.” AirMedia fit all these requirements. Nickell says the team had looked at another screen-sharing system, and while it could have worked it had several downsides. First, it requires a USB puck-shaped transmitter to connect to every student device, and these transmitters can be lost. The receiver is large and difficult to mount, while the AirMedia receiver will tuck behind the flat-panel display. The other system requires its own wireless network, while AirMedia ties into the Wi-Fi network already installed on campus. And finally, it would have cost almost three times as much as AirMedia. “From a technology and cost basis, it was a win-win to make the change,” Nickell says. Some universities use a product that includes file sharing as part of the collaborative package. Dema says they did not even consider that options. “Our students don’t need me to tell them what system they should use for file sharing. Google Drive is the norm here, but DropBox is pervasive on this campus and we have our own open source sharing site called Jewell Commons.” She says that the collaborative systems cannot work without a robust infrastructure, including a high-bandwidth Wi-Fi network, the large screen displays and a means to send images to those displays, but the students know best what devices and software applications to choose. The technology team used extensive input from faculty and made a number of visits to other campuses in designing this facility; they also created five pilot classrooms prior to finalizing their designs. “We ran a faculty workshop about learning environments to introduce a grant program where they could write a proposal to change their teaching spaces,” Dema explains. “One of the rooms we rebuilt has whiteboard tables and multiple screens; one emphasizes enhanced visuals and sound; two have multiple projection systems where they can project from up to three devices at once,” Fisher adds. All of these rooms were operational while the Pryor Learning Commons was under construction, and what the team learned from them went into the final technology designs. According to Dema and Fisher, the results of all this effort have been well worthwhile. “The day we opened this new building our students filled it — and it’s been in constant use ever since,” Dema says.